Maxtruck 2T is a unique forklift that can move in all directions - in 360°. This simplifies material handling in warehouses or production facilities. Forklifts have greatly facilitated indoor and outdoor materials movement in manufacturing and logistics companies all over the world. 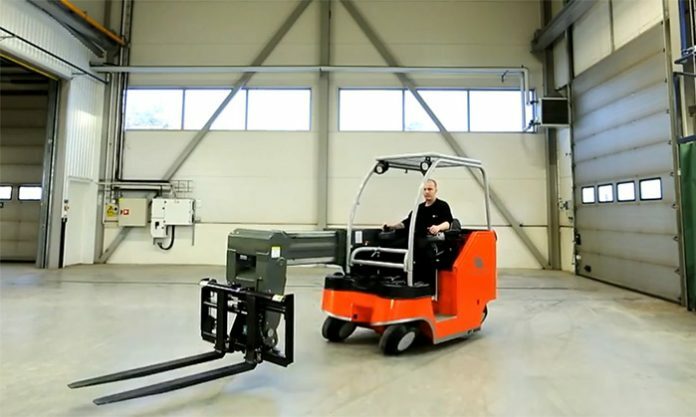 The Maxtruck 2T is a unique kind of forklift that is equipped with omnidirectional wheels. Unlike regular or 4-way forklifts, Maxtruck 2T not only moves in two or four directions but in all directions. This has the potential to ease the handling of materials and products in production facilities or warehouses. MaxTruck 2T is designed based on a unique mobility technology that allows 360 degrees movement. The machine is equipped with a synchronous motor drive that is responsible for its high-energy efficiency. MaxTruck 2T consumes about 30-50% less power than similar devices. There is also a patented SAE safety system that helps the driver to avoid collisions and crashes. One of the many unique features of the Maxtruck 2T is its admirable level of versatility. With a wide range of attachments such as service platforms, lifting beams and alternative forks, the device can act as more than a forklift. The device is designed such that the service tools can be changed easily. In addition to its energy-saving operation, MaxTruck 2T further comes with a special battery trolley that houses an extra battery. The operator can easily replace the machine’s battery, giving room for 24-hour operation. To suit the needs of a wide variety of factories, MaxTruck 2T has two driving modes. The driver has the freedom to choose between driving the forklift like the omnidirectional truck it is designed to be or driving it like a conventional forklift. Switching between the two modes could prove very useful for drivers that alternate between straightforward and difficult terrains. The patented safety system ensures the driver has perfect control over the Forklift at all points in time. All important operational parameters such as speed and stability are controlled by the safety system. The driver can concentrate on the core task at hand, rest assured that the machine would not overspend or tilt over. MaxTruck 2T is designed to be comfortable and safe for both the driver and other workers alike. The design is such that the driver has a full view of the work environment thus minimizing collisions. All the controls of the machine are also situated at points where they can be easily seen or operated by the driver. You can visit the official MaxTruck website if you need more info about reserving a MaxTruck 2T for yourself.